This article is about rising rents in European cities. Probably, most of you reading this have experienced what this means at one point or another. Probably, most of you know at least a few stories of people struggling to find a not-crazy-expensive home somewhere. Probably, most of you have noticed how having a nice apartment in any city centre has more and more become a luxury, only available to a few. When I decided to move to Stockholm, many people around me warned me about the tough housing situation. The same way people warned me when I moved to Amsterdam, and later when moving to Berlin. Having already some experience in searching for homes in different European cities, I used to feel like I was quite prepared for it: ‘yes, I guess it’s tough, but I’ll manage’. But I have to admit: the housing situation in Stockholm is much crazier than I had expected. Funnily enough, the rental market in Stockholm is strongly controlled with the intention to avoid, or at least minimize, the impact of neoliberal forces of offer and demand. This means that rental companies, owning a majority of the apartments for rent in the city, need to comply with a rent cap to stop them from charging more than what is regulated. Therefore these apartments are relatively cheap in comparison with rents in other European capitals. However, to be able to rent an apartment from one of these rental companies you will need to queue up. The demand highly exceeds the offer: at this moment, it takes over 20 years to get to the front of the queue and only around 40% of the people in the queue manage to get a contract through this system. These contracts are called ‘first-hand contracts’ and are extremely valuable for Stockholm’s inhabitants. Stockholm’s Slussen area in Södermalm, one of the central districts of the city. You probably guessed it already: once people manage to get such a contract, they don’t easily let it go. Therefore, an enormous subrental market has arisen: people with first-hand contracts that, for whatever reason, do not live in their Stockholm flat anymore, sublet the place to people unable to get a first-hand contract themselves as the queue is barely moving. The queue is barely moving because few people with a first-hand contract give up their flat. It is a vicious circle. In the meantime, the ‘second-hand contracts’ (third-hand, fourth-hand, etc.) leave tenants in a very unstable and risky situation as these are usually short-term, for one or two years. There are regulations on subletting your first-hand apartment, however often this is done somewhere in the grey zone between legal and illegal. 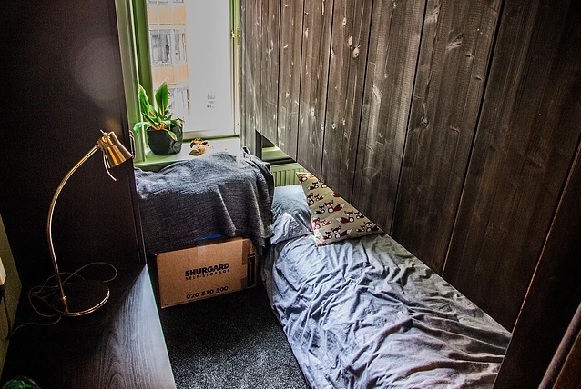 This pushes many people to buy an apartment – it is not uncommon to meet Swedish students living in an apartment they bought with the help of their parents. As a result, buying a place in Stockholm has almost become unaffordable. Even Spotify has openly complained about the impossible situation, pointing out that finding affordable housing for the foreign talent it aims to attract to its headquarters, located in the centre of Stockholm, has become a huge issue. If even Spotify employees are facing problems, imagine how it is for the bottom part of society. Although the housing market in Stockholm has its own crazy particularities, it is not an isolated case. In the last years rents and mortgages have been rising and rising in basically all European capitals and larger cities. Finding an affordable place to live has become more and more difficult especially for people with less money to spend, including students and young people looking for their first home. Almost half of Europeans spend more than 40% of their income on rent. The number of people between 18 and 34 years old still living at their parents’ house has reached pre-World War 2 levels: the situation is worst in Slovenia, where 74% still live at home, second comes Italy with 66% and in Portugal it is 55%. London and Paris are the famous cases of high rents. Amsterdam’s city centre has become unaffordable for many. Athens and Munich have been struggling with an increased number of homeless people. Berlin has become the new paradise for investors, which means rising rents everywhere. Dublin has been struggling with a high demand for rental housing due to the numerous multinational companies located there. Lisbon has seen an enormous increase in rents in the last few years, not at all in line with the purchasing power of the local population. Nowadays the complex housing situation is a priority in cities all over Europe however it does not look like it is getting better any time soon. So what is happening? It’s fairly simple: the number of people in search of a house in the city is higher than the number of houses available. While Europe’s countryside has become less and less attractive due to the lack of job opportunities, the urban population has been growing. The amount of available housing has not grown at the same pace. Although most European countries have laws to regulate and control their housing markets, these are still mostly based on the neoliberal principle of offer and demand. Of course, everyone wants the light and spacious apartment located on a top location in the city – meaning that the one with the most money gets it. And even when this is not the case, as in Stockholm, the system is still unable to cope with the enormous demand for housing. Where is this going? What can we expect? Will we just keep on paying more money for less space? Young people are spending an increasingly large part of their income on rent, or acquire high mortgages to be able to buy a place they can call home. What can we do now to prevent this situation to become even worse for the next generation(s)? Of course we can build a lot of new housing, however, this implies high social and environmental risks. The more a city expands outwards, the more people have to commute towards their jobs or schools, the more suburbs become socially segregated – with wealthy urban people living in the city centers and the poorer ones in the outer suburbs – and the more our natural landscapes become urbanized. Instead, it is time to look for alternative solutions. Several cities have witnessed the rise of concepts such as TechFarm (located in Stockholm), where one building or floor is divided into small private spaces and larger community spaces in order to make an as efficient as possible use of space. Even though this solution would not fit a majority of the people, it is worth reconsidering the way we use space in a city, and how much space we actually need. Besides, strong regulation has been proven successful in many places, especially when we look at Berlin. The city has been on the forefront to restrict temporary renting through platforms such as Airbnb and to block the sale of buildings in the city to international investors. Its regulations on rents are ambitious and even though it does not prevent the rents from rising, it does prevent them from being subject to the speculation of investors. And despite the fact that Stockholm’s current housing situation is the living proof of strong housing market regulation gone wrong, social housing is often the only option left for many people. So people were right to warn me about the housing situation in Stockholm. Fortunately, I have been quite lucky to find a room, and due to a large subrental market it is not impossible to find a student room – although it will be expensive and most likely be located in one of Stockholm’s many outer suburbs. However, if you are ever thinking about getting your own flat in the city, you better start queuing up now. Even though there have been many discussions about the flawed rent control system in Sweden, eliminating the system is complex and will certainly not improve the availability of affordable housing. There is no straightforward solution, as is the case with most things that matter. However, how to ensure affordable housing without requiring spatial expansion is and will be one the main challenges for Europe’s cities in the upcoming decades. Jessica Verheij is originally from the Netherlands but has spent a major part of her life in Portugal. After a BA in International Relations, in Lisbon, she moved to Ghana and later to Amsterdam, where she took a Master's degree in Human Geography. After some time in Berlin, Jessica lives now in Stockholm.